Quick story time: Back in 1998, I wanted to start my own PR firm, but had absolutely no money. I did, though, have an idea for a t-shirt. The movie “Titanic” was coming out on video, so I took my rent money, and had 500 t-shirts printed up that read “It sank. Get over it.” I hoped to sell 180 shirts and make my rent money back. I went into Times Square on a Friday night with 500 t-shirts and sold them all. I called a reporter the next morning from USA Today and told her my story. She asked if I was selling them online. I lied and said “of course,” building the world’s worst web page while on the phone with her. The next morning, my hosting provider called me asking why I’d crashed half their servers in the past two hours. The story ran on the front page of USA Today, and in two months, I sold over 10,000 shirts online, clearing about $100,000 dollars, and my first agency was born. More importantly, though, that was the day I became an entrepreneur. This year marks 20 years since I went out on my own, and I can’t imagine doing anything else. Lesson? Do what you love to do, work really, really hard at it, and figure out how to make a living at it. 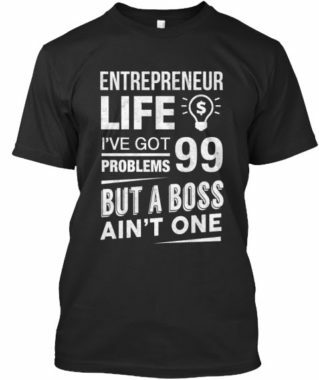 In honor of my 20 years of surviving (and occasionally thriving,) I crafted a t-shirt for entrepreneurs, that I think captures the essence of why we do what we do. It also makes the perfect gift. It’s available for this week only. Why not pick one up and show your entrepreneurial spirit? I bought one of those original shirts it was great and I’m glad to know it worked out so well for you. !